Items are based upon articles from sources shown. If our visual abilities are superb, those of the chameleon are nothing short of spectacular. Drs Frank Schaeffel and Matthias Ott, of the Research Centre for Experimental Ophthalmology at the University of Tübingen in Germany, found that this lizard, renowned for its unique camouflage abilities, is able to sharply focus images over an astonishing range. Its eye can 'accommodate' from infinity right down to a distance of only three centimetres, as opposed to six or seven centimetres in people. In fact, we only see things as sharply focused as a chameleon does once they are at least 30 centimetres away. This incredible reptile, whose name means 'earth lion' in Greek, has an eye like a telephoto lens. Whereas our brain measures distances largely by comparing the angle from each of our eyes, the chameleon is able to measure distance by sensing the 'setting' on its 'tele–objective' —with either eye on its own. 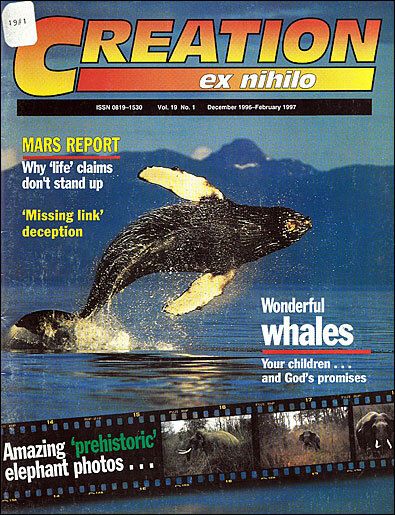 Factum, p. 49, July–August 1996. According to evolutionary reconstructions of the timing of events, the land bridge joining North and South America only formed well enough to allow animal migration 2.5–3.5 million years ago. However, new work on fossils means that according to their interpretive system, large mammals such as tapirs, gomphotheres (an extinct type of elephant) and camels crossed over to South America more than six million years earlier. Large ground sloths (believed to have come the other way) must have, according to this new 'dating', been making the reverse journey more than four million years before the isthmus was fully established. So how did they get across? They must have swum, say evolutionists, who postulate that some land was already above water, so they alternated between swimming and walking. New Scientist, p. 15, 29 June 1996. While this 'swimming' proposal is not unreasonable, imagine if creationists had used this as a possible explanation for the migration of some animals to various continents after the Flood (most of the alleged difficulties actually have some very reasonable answers—see The Answers Book, chapter 12). According to the 'big bang' model of cosmic evolution, deuterium, a heavy isotope of hydrogen, was formed in the first few moments after this (alleged) explosion. Also, knowing the abundance of deuterium in the universe enables a prediction to be made of the abundance of helium and lithium—if the big bang is true. Some careful measurements by a team led by David Tytler, of the University of California at San Diego, seem to have given us a good idea of the abundance of deuterium in space. They looked at the light coming from a distant quasar, which, as it passed through clouds of gas, would reveal the 'signature' of this heavy form of hydrogen, showing how much was present. There was only 10 per cent of the deuterium present than was previously believed. This means that, if current big bang models are right, there should be much more helium and lithium around than we actually see. New Scientist, p. 18, 18 May 1996. Sadly, many leading evangelicals have been seduced into seeing the evolutionist's big bang as if it were a 'fact', which demands re-interpretation of the Word of God. A common mutational defect carried by about one in 100 Europeans may help to protect against certain forms of AIDS. HIV gets into certain immune cells with the help of two receptor molecules, like 'handholds' on the outside of the cells. Researchers have found a mutated form of the gene which codes for one of these receptor proteins on these cells. The protein has lost the chemical 'handles' which the virus needs to get inside the cell. New Scientist, p. 12, 17 August 1996. Mutations are inherited copying errors in the DNA 'recipe' of an organism. Evolutionists rely on these to give the new, useful information needed to turn microbes into men. Because natural selection is useless in evolving microbes to men unless it is provided with lots of new, useful information, evolutionists rely on mutations to add this. But where do we see examples of such 'uphill' mutations? Information losses/defects occasionally help survival (like this case, or the wing-less gene in beetles on windy islands, which reduces the chance of their being blown into the sea). This is the end of death,' says Dr Chris Winter. He was referring to British Telecom's ambitious project, dubbed Soul Catcher 2025, to develop, by the year 2025, a chip which could be implanted in someone's skull to record all their life experiences. The aim is for this then to be 'downloaded' to another person, or played back on a computer. Daily Telegraph, 18 July 1996. Apart from huge biotechnological hurdles, which make Jurassic Park's dinosaur recreations look like child's play, even BT says that such a 'chip' would require the memory capacity of 7,142,857,142,860,000 of today's floppy disks. In any case, most materialists would concede that conscious self-awareness (let alone what it means to be truly human in God's image) is more than just linear 'number–crunching' of a stream of digital data. When the Romans overran Western Europe with their military might, the cultures they displaced were illiterate, primitive and backward. Or at least so goes the prevailing mythology. Now the discovery of a form of writing, preserved on scores of fragments of pottery, challenges that view. It appears that this 89–symbol script dominated Britain, France and Spain around 1500 years before Christ. The Sunday Times, p. 17, 16 June 1996. The early settlers of Western Europe were the descendants, not of apemen, but of those affected by the Babel dispersion, a couple of centuries after the Flood. While the Babel judgment may have resulted in the loss (for many) of much cultural 'know–how', including the loss of previous written, as well as spoken, language, there is no reason for these early people to have been any less intelligent than people today. Thus it is not surprising that they would soon develop an alternative style of writing. Robert Bauval and Graham Hancock are two British academics who have co–authored a book Keeper of Genesis. In it, they argue that the Sphinx was built by the survivors of an earlier race than the pharaohs, and that it, the Great Pyramids and other monuments at Giza form an astronomically aligned diagram. Discussing work allegedly going on to locate and open ancient cavities under these monuments, they refer to archaic texts which speak of a 'hall of records' preserving the entire knowledge of a lost civilisation which 'discovered the secret of immortality'. They refer to the work of geology professor Robert Schoch to claim that the Sphinx has 'distinctive erosion patterns which could only have been caused by rain'. They say this shows that it was built more than 7,000 years ago, making it some 2,000 years older than the pharoahs. The Scotsman, p. 8, 24 May 1996. (i) All surviving structures/monuments must have been built by civilisations after the Flood. (ii) The Giza monuments were built at a time quite close to that Flood, so if there really are recollections of a 'lost civilisation' with 'secrets of immortality' this may well be a memory of the pre-Flood world, with its huge lifespans. (iii) Patterns of rainfall since the Flood/post–Flood Ice Age would have changed rapidly. There is general agreement that places like the Sahara and inland Australia once had much more rainfall. If the Sphinx has indeed been subject to rainfall erosion, (others claim that wind–blown damp sand would have had the same effect) then this would have been much closer to the present than these authors' speculative dates. Everyone's favourite monster has had media prominence twice in recent times. First the discovery, in Thailand, of a smaller version (probably only two tonnes) of Tyrannosaurus rex. This was hailed as an ancestor to the 'king tyrant lizard', showing that it evolved in Asia. However, the discovery was only the left half of the pelvis, the sacrum and 18 vertebrae. [Maybe a teenage T. rex?]. Second, scientists at the University of California at Berkeley made a metal replica of the teeth of a tyrannosaur to see how much force it would take to imitate, in cow bone, the T. rex tooth marks found in a fossil Triceratops pelvis. The force needed was the same as putting the weight of a pickup truck on top of a single tooth, showing that T. rex was capable of powerful biting. The marks on the pelvis indicate repetitive biting/chewing, so their owner was dead before the marks were made. No classical 'kill' toothmarks by T. rex in a spine are yet known, which if found would oppose the theory that T. rex was merely a scavenger. The Times, 20 June 1996. Nature, pp. 706-708, 22 August 1996. New Scientist, p. 12, 24 August 1996. Brisbane Sunday Mail, p. 56, 25 August 1996. Many scientists have long held that T. rex's teeth/jaws would fail in strong biting. This evidence points in the opposite direction. However, dinosaur expert Jack Horner still thinks that it was a scavenger, not a hunter, because its tiny arms would not allow it to hold struggling prey.